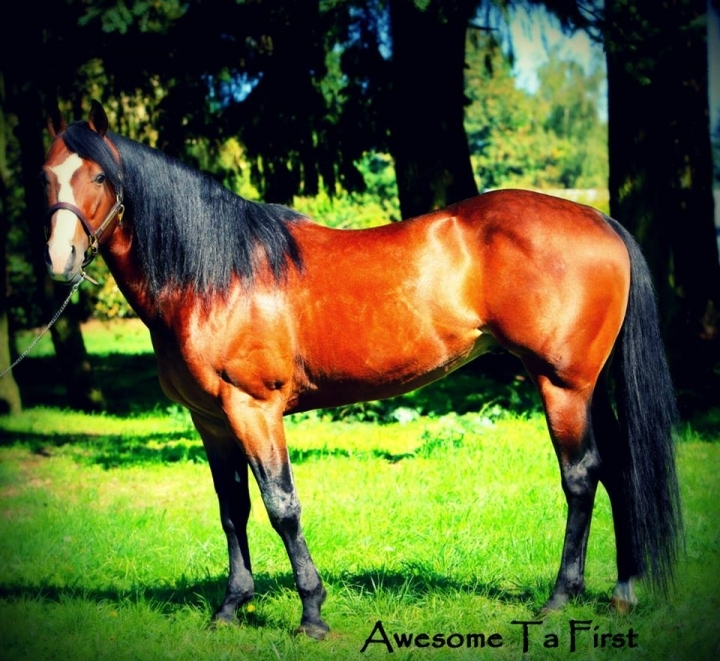 Awesome Ta First is a gorgeous 2002 Bay Stallion who is 15'2 and 1250lbs He is sired by the great Dash Ta Fame and our of the exceptional producing mare Lena First by Switch O'lena! Eligible Incentive Funds: Future Fortunes VGBRA BRN4D more incentives as needed Awesome has many career wins and highlights at all levels of barrel racing competition: Rodeos: Winning the Eastern Oregon Livestock Show and Rodeo in Union, OR Reserve Champion Molalla Buckeroo Prorodeo in Molalla, OR - 17.25 Reserve Champion Sublimity Prorodeo in Sublimity, OR Multiple time money winner at St. Paul Prorodeo in St. Paul, Or Multiple time money winner and finals qualifier at Ellensburg Prorodeo in Ellensburg, WA Multiple time money winner at Crooked River Round Up Prineville, OR Placed at Kitsap Stampede Prorodeo Bremerton, WA Placed at Thunder Mountain Prorodeo Longview, WA Placed at The Dalles Prorodeo in The Dalles, OR Placed at Farm-City Prorodeo both go's & Average in Hermiston, OR Qualified Serena Mote to the Columbia River Circuit Finals for two consecutive years! OTHER HIGHLIGHTS: Won the 2nd go of the Derby and Open 1D at the Southwest Washington Futurity & Derby in Salkum, WA Won the Derby and 3rd in the Open 1D at The Tuff Enough to Wear Pink Race in Aurora, OR - 17.369 2nd in the 2nd go of the Derby at the Sandcup in Pasco, WA - 17.240 LTE $30,000.00 plus Awesome has two full siblings that are barrel racing superstars as well; Famous Showgirl : LTE $100,00+ 2003 Bay Mare Southwest Washington Futurity Champion Southwest Washington Derby Champion 2X VGBRA Maturity Champion and Maturity Stallion Incentive Champion Appleatchee Maturity Champion BRN4D Year- End Derby Champion Clark County Fair and Rodeo 3X Champion Columbia River Circuit Pro Rodeo Finalist BRN4D Washington State Champion 2X NBHA Washington district 08 1D Champion 2X NW5D Finals Fast Time 17.195 Numerous Other Open 1D wins Multiple Prorodeo and NPRA rodeo money Earner Splash Talena: $125,000+ 2005 Bay Gelding Greg Olsen Futurity Champion VGBRA Futurity Stallion Incentive Reserve Champion WPRA Futurity Year-End Reserve Champion Barrels of Gold Futurity Reserve Champion Tuff Enough To Wear Pink Futurity Champion BRN4D Futurity Year-End Champion Placing at SWWA Futurity, Sandcup Futurity, Appleatchee Futurity, BRN4D Finals Futurity Columbia River Circuit Pro Rodeo Finalist placing in 2 go rounds and Average Multiple WPRA Prorodeo and NPRA rodeo money Earner Producers Gone Wild American Qualifier 2nd place Ran a 16.96 on a standard Qualifying for The RFD-TV'S American Rodeo NW5D Finals Champion Let Freedom Ring Champion NBHA Washington State Finals 2nd Go 1D winner Numerous Other Open 1D wins With very limited foal crops Awesome has numerous babies that are barrel racing money earners. Including Shz So Awesome, Awesome Sheriff, Smokin Ta First, and Awesome Swift and Easy. 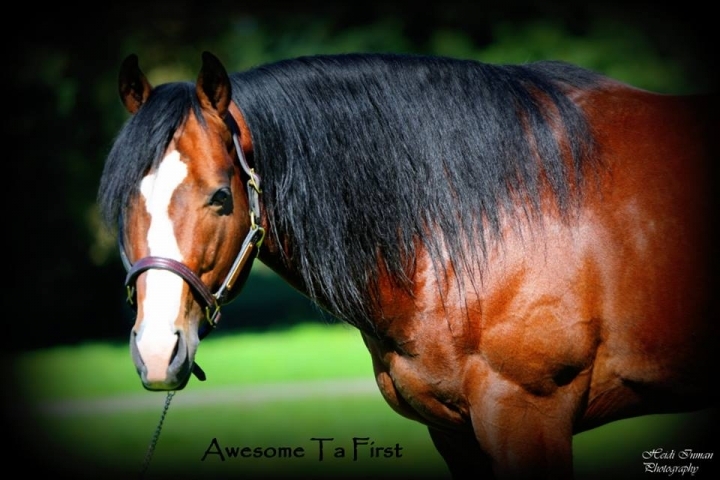 These offspring have won at all levels including futurities, derbies, and open 1D money.